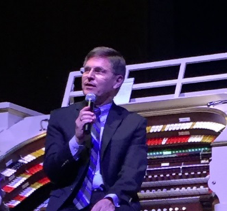 Ron Rhode gave an extraordinary performance on March 18 as the Dickinson Theatre Organ Society (DTOS) continued in its 47th concert season. 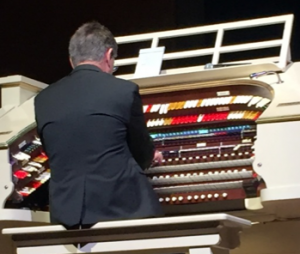 Before the show, Ron told me that he was going to perform traditional theatre organ music. He said, “I like playing the ‘old stuff.’ That is how I was trained, it’s what I know, and it’s what I have built my 49 year career on.” As we learned later in the concert, this performance was to be his last public performance. Ron explained, as he became a bit choked up, that he is at the top of his game and now it is time to say goodbye. He dedicated this concert, a musical thank you of sorts, to all the people that he loves, and all of those who love him. He admitted that it was a bit selfish, but he was going to play all of his favorites from throughout his career. And that was okay with us! Ron, no stranger to DTOS, began his performance with I Feel a Song Coming On, followed by the 1913 favorite Doo Wacka Doo, featuring the reeds and xylophone. Next he played a hit from the Looney Tunes cartoons (1927) Isn’t it Heavenly, which highlighted the strings with the harp, followed by The Very Thought of You. During his trip down memory lane, Ron played a song he learned in first grade, Teddy Bear Picnic, followed by a most unassuming Walkin’ My Baby Back Home. His performance of Irving Berlin’s 1927 song protesting prohibition, I’ll See You in C-U-B-A, featured the organ’s percussion sounds, such as the castanets. Another one of Ron’s favorites, With a Song in My Heart, was followed by a Peter Pan Medley from the 1954 musical, featuring I’m Flying, I Won’t Grow Up, Distant Melody, I’ve Gotta Crow, and Never Never Land. He ended the first half with the ragtime song, Bunny Hug Rag, which featured the Mighty Kimball’s harp, wood harp, piano, xylophone, and ended with, as Ron quipped, the “kitchen sink” and the pedal cymbals. Ron started the second half of the concert with Irving Berlin’s (1927) Shakin’ the Blues Away. Incorporating the works of Paul Weston and his orchestra, as well as Ruth Etting and Jesse Crawford, Ron played his own rendition of the 1937 I’m Confessin’. Having been trained to “hand register” organ settings in the days before “combination action,” Ron, a self- proclaimed “dinosaur” evidenced his talents as his hands continually moved around the entire console adjusting the tabs and settings to make the perfect combinations and collection of sounds throughout each piece that he performed. His next selection was the Rapasz Band March, followed by Henry Mancini’s (1965) The Sweetheart Tree from The Great Race, highlighting the softer sounds of the Mighty Kimball. Ron brought to life some sounds within the Kimball that we haven’t heard in quite a while. Flapperette, a light and quickly moving piece was one such example, as was The March of the Steel Men, in honor of the steel industry in Pennsylvania. I couldn’t stop my toe from tapping! “Operetta is the backbone of what I do,” Ron continued as he played pieces from The Student Prince, including the Drinking Song and Serenade. Again showcasing some of the softer sounds of the organ, Ron played True Love, a piece sung by Grace Kelly and Bing Crosby in High Society in 1956. 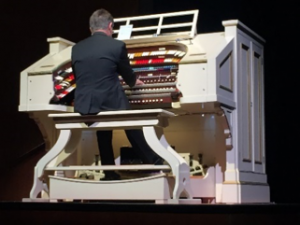 He ended the concert with some of the biggest sounds of the organ as he closed with the March and Procession of Bacchus, to which the audience responded with a standing ovation. His encore selection was Me Too (Ho-Ho! Ha-Ha!). Ron is an outstanding organist, trained in both classical and theatre styles. 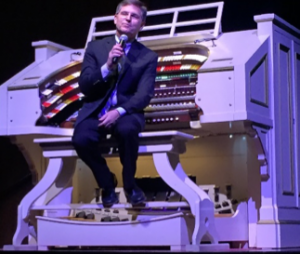 From his tenure at the Organ Stop Pizza in Arizona, to his being named one of the most popular theatre organists in the country, including being awarded the 1989 ATOS Theatre Organist of the Year, Ron has been entertaining audiences for almost half a century. DTOS is proud that Ron chose our concert and the Mighty Kimball for his last public performance. We tip our hats to Ron Rhode for a spectacular career. Ron, you are definitely going out “on top!” Congratulations and we wish you the best in your retirement!